One of the great paradoxes of automotive history is that while the Ford Motor Company was the first mass manufacturer to produce affordable V8-powered cars, it is the Chevrolet small-block V8 that has gone on to become the most famous and loved of all eight-cylinder engines. In naming the 10 best engines in history, Ward’s AutoWorld found a place for the Ford side-valve flathead V8 but the only postwar V8 from Detroit to get a spot was the Chevrolet 350 cubic-inch unit. The postwar boom in the US created a huge proliferation of new models and, by the mid-1960s, what became known as the horsepower race. In our current era where the same basic engine might be found in Peugeots, Citroëns and the Australian Ford Territory, it is difficult to grasp the fact that General Motors was so rich that most of its divisions had a unique range of V8s and in multiple variants. When the Chevrolet Division introduced the 350ci V8, Buick had a 340 (as well as its 300, 400 and 430), Oldsmobile had a 330 (plus its own 400 and a 425), Chevy’s closest sibling Pontiac had a 326 (and yet another 400 and its 428) while GM’s flagship brand Cadillac had a solitary 429. None of these engines could match the production life of the Chevy 350 which made its debut in the 1967 Camaro 350SS, tasked with the challenge of stealing sales from the phenomenally successful Mustang. Although replaced by the Generation II LT and Generation III LS engines in the 1990s, it was not discontinued until 2003. And it remains in production in Mexico as a crate unit for Chevrolet Performance. To understand the significance of the 350 it is necessary to look at the history of Chevy’s small-block V8. While Cadillac had always been GM’s top brand, Oldsmobile was usually the one where new engineering was first applied. So it made sense for the high-compression V8 engines to make their 1948 debut in both marques for model year 1949. The chief designer of the Cadillac engine was Ed Cole (see below). In 1952 Cole was transferred to Chevrolet Division where the engineers were already at work on a new high-compression V8 intended for the Corvette. The view at the time was that without a powerful V8 engine the model would have to be discontinued as the ‘stove-bolt’ 165hp straight-six gave the wrong message for the corporation’s only dedicated sports car. Apparently Cole didn’t like what he saw and he told the team to begin from a clean sheet of paper to design an engine that would be more efficient, easier to manufacture and less bulky. Thus his experience at Cadillac at the top of the GM hierarchy was transferred to humble Chevrolet at the bottom. While rival manufacturers required up to 22 casting cores, Chevrolet used just 12. Rather than conventional heavy and complex rocker arm shafts, Chevy’s small block got stamped steel rocker arms on individual studs. This innovative valvetrain design was key to the engine’s high rpm performance. High turbulence, wedge-type combustion chambers (where only the valve seats needed machining) minimised octane demand. Rotating and reciprocating components were balanced individually. A forged steel crankshaft was used. Connecting rods were tested to 18 million cycles without failure. The interchangeable cylinder heads were of cross-flow port design and the head bolts were arranged pentagonally to spread stresses more evenly. ‘Interchangeable’ went on to become a key adjective for the small block. It is possible to fit worked 350 cylinder heads onto a stock 1955 265. The one-piece intake manifold combined the water outlet, oil filter, the lifter valley cover, distributor mounting and exhaust heat riser in a single casting. In its original 265ci guise the small block developed 162hp. With the optional ‘Power Pack’ comprising a four-barrel Rochester and dual exhausts, output was 180hp, which was more than respectable in 1955. The 265 was bored from 3.75 inches to 3.875 to create the 283 for 1957. Then for the 327 in 1962, it was bored again to 4.00 inches and stroked from the original 3.00 inches to 3.25. At 4.00 X 3.25 this was a notably oversquare design. Then for model year 1967 Chevrolet introduced the 350 with a new crankshaft and a stroke of 3.48. The first version was known as the L-48. It promised buyers of the all-new Chevrolet Camaro SS350 295bhp and 380ft/lb of torque. The L-48 soon became optional on a huge variety of Chevrolets, including Impalas, El Camino utes and Chevelles. It had cast pistons and a compression ratio of 10.25:1. For 1968 it was offered as optional equipment in the Chevy II Nova as the main element in the $211 Super Sport option on two-door models. Although the 350 was developed from the 327 and would eventually replace it, it didn’t find its way under the bonnet of the Corvette until 1969. 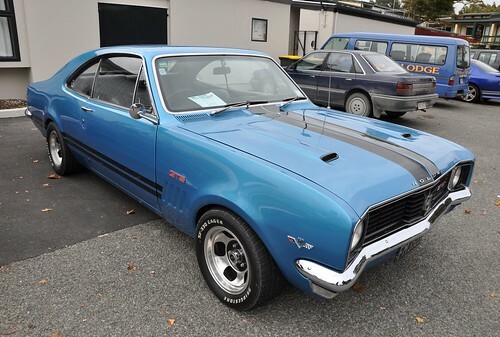 Which was also the year Colin Bond won Bathurst in a so-proudly-Australian Holden Monaro GTS 350. The L-48 became the entry-level ’Vette engine, superseding the previous model’s 300hp edition of the 327. This peak output was unchanged but Corvette buyers could specify the optional L-46 with 350hp for $132 extra. And then there were the big blocks with the 427 offering as much as 435hp by 1967. For 1970, the 350 became the standard V8 for all full-size Chevrolets, which now included a large coupe in the Ford Thunderbird ‘personal’ idiom. The Monte Carlo undercut its Ford rival by some $1250, or roughly 30 percent. The 350 made just 250hp but Monte Carlo buyers looking for more grunt could tick the SS-454 option box to acquire the ‘Super Sport’ package which included a 360hp big-block 454 V8. Within its first three years the 350 small block was offered in several levels of tune, the highest of which was the LT-1. Introduced in 1970, it was available in the Corvette (ZR-1) and Camaro (Z28). At 370hp, it had almost 50 percent more power than the the 350 in the Monte Carlo. The LT-1 boasted solid lifters, a revised camshaft, a four-barrel 780 CFM Holley on an aluminium intake manifold and 11:1 compression ratio. The 350 was not the only small-block V8 available in Chevrolet’s Mustang-rival. 1967 became a huge year for the already famous small-block V8. A unique 302ci (4.9-litre) unit was created to make the Camaro Z28 eligible for the Sports Car Club of America (SCCA) Trans-Am series. For 1967-69 capacity was limited to 5.0 litres. This remarkable new engine showcased Chevrolet’s small-block V8 technology. The three-inch crankshaft from the 283 was fitted to a four-inch bore 327 block. With such a short stroke it loved to rev. A 780cfm four-barrel Holley was fitted. Compression was 11:1. The following year the 780 was swapped for a pair of 600s on an aluminium intake manifold and a different camshaft. Larger journals were fitted to support the new hardened forged crankshaft. For 1969 the factory admitted to 290hp beneath the newly fitted Corvette finned aluminium valve covers, but 375 was nearer the truth. It is improbable that either Ed Cole or R.F. Sanders could have guessed at the beginning of the small block program that by 1968 their baby would be the dominant engine in American Formula 5000 open-wheeler racing. These cars weighed 1400 pounds, produced up to 550hp running through a five-speed magnesium transaxle. Despite the inclusion of such advanced features as mechanical fuel injection, a magnesium induction system, a roller-lifter camshaft and roller rockers, the 302 retained an almost stock crankshaft. What a contrast with the fate of the 350 LT-1 as clean air demands outranked the cry for ever increasing power. It fell from a 370hp (SAE) rating in the 1970 Corvette to 255hp (SAE net, meaning installed in the car and running the ancillaries) by 1972.From 1973 to 1980 the L82 was the hottest 350 with forged pistons, a compression ratio of 9.0:1 and 250bhp (SAE net) in the first of these years dropping to 230 by 1980. Then in 1981 came the L81 and the ’Vette was humbled to 190hp. The 1982 L83 was available only with an automatic transmission and claimed a further 10 horsepower. For 1984 there was a new Corvette. Its L83 was equipped with throttle-body injection. Power crept up to 205hp. From 1985 to 1992 the L98 350 with tuned port injection saw bigger performance gains with horsepower ratings from 230 up to 250. This engine was available in the Camaro and its kissin’ cousin Pontiac Firebird from 1987 to 1992. A roller camshaft was fitted from 1987. By the 1990s the triumph of the Chevrolet small block over other similar capacity GM V8s was complete and the L05 350 was used in the 1992-93 Buick Roadmaster, the Cadillac Fleetwood and Brougham (where it was an option) and was optional in the 1992 Oldsmobile Custom Cruiser wagon. The Gen II arrived in the ’92 Corvette and was named LT1 (no hyphen) as a tribute to the original LT-1. It wasn’t by any means all-new, retaining the classic bore and stroke dimensions of 4.00 X 3.84 inches. Interchangeability remained a key criterion. The rotating assembly of the Gen II fits many of the older engines, but the block and heads were new. The reverse-flow cooling system favoured the combustion chambers reducing the risk of detonation now the compression ratio was back to 10.4:1. Cast-iron heads were used on the mainstream Chevrolet Impala and Caprice while the Corvette and Camaro/Firebird scored aluminium. Welcome was multi-port fuel injection. Maximum power was 330hp in the LT4 (1996-97 Grand Sport Corvette, Collector Edition Corvette and all ’96 manual Corvettes). The Gen III of 1997 was a big departure. It had an aluminium block when used in cars while trucks made do with cast iron. The capacity was still 5.7 litres but the bore was 3.898 inches and the stroke 3.62. The premium LS1 version was used in the ’Vette from 1997 and the Camaro/Firebird from 1998. In LS1 guise the Gen III was offered in the VT Commodore, Statesman, Caprice and HSV range from 1999 to 2005 and was continually refined. The Gen IV was based on its predecessor but boasted capacity of up to 7.0 litres. Holdens use the 6.0-litre L76 (270kW) while HSVs get the hot LS2 of 6.2 litres and with maximum power outputs of 317kW and 325kW. On 30 November, 2012 the 100 millionth small-block Chevrolet V8 emerged from the production line. Enough said. EdwardD N. Cole died in his own aeroplane on 30 October, 1967. There are many things he is remembered for but some are more celebrated than others. Born on 17 September 1909, Cole enrolled at the General Motors Institute (GMI) at Flint, Michigan in 1930 under Cadillac sponsorship. At Cadillac he rose through several positions to become chief design engineer for US Army combat vehicles. That was in 1943. Three years later he was chief engineer at Cadillac and he was responsible for the high-compression, short-stroke Cadillac V8 that was slipped beneath the bonnet of the 1949 model. In 1952 he became chief engineer at Chevrolet and one of his first jobs was to tell the team working on the forthcoming V8 engine to rethink the design. And, no, he did not just ask for a smaller version of the Caddy engine because several years had elapsed and he always wanted the newest and smartest. In July 1956 Ed Cole was named general manager of Chevrolet and made a vice president of GM. It was Ed Cole who insisted Chevrolet’s compact car, the Corvair, have an air-cooled rear-mounted engine. He also launched the car in the knowledge that it was much too easy to roll, siding with the accountants over the engineers. In November 1961 he was promoted again to the Board and put in charge of the car and truck divisions. Next, in July 1965, he became executive vice president en route to the top job. In 1970 he instructed GM engineers to lower compression ratios (see main story) and design engines that could run on unleaded petrol. When he retired in 1974 he held 18 patents, the most significant of which was the catalytic converter.